Twenty Augsburg College education students have begun step two of a three-year, $750,000 grant project aimed at immersing faculty members and students in both learning and applying "cutting edge" technology to the teaching world. On Tuesday, Jan. 30, the students -- from both Augsburg's Day and Weekend College programs -- began the intensive project under the guidance of project director Sonja Schmieder and Education Department faculty members Joseph Erickson, Gretchen Irvine and Bill Bierden. The Department received the grant earlier in the year from the U.S. Department of Education's "Preparing Tomorrow's Teachers to Use Technology" program. During the fall semester, all Education Department faculty were taught new skills in the use of technology including how to create and maintain their own web pages. Now this first group of students will learn how to utilize technology ranging from use of the Internet to digital photography and fax machines in day-to-day classroom teaching. Once they are comfortable with what they have learned, the students will go out to urban public and charter schools, which have partnered with Augsburg for this project. There, they will be given the opportunity to teach and help implement the use of technology. The program's ultimate goal is to embed technology across the curriculum and create technology-proficient teachers. 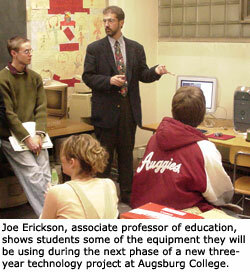 Eventually, all of the students in Augsburg's teacher education program will be taught these new methods. The College also will move outside the boundaries of the grant to coordinate the State's first-ever Teacher Education Technology Day on Friday, Feb. 9th, at Eagan High School. All Minnesota teacher preparation institutions have been invited to participate in technology awareness-building activities, including examples of technology integration in instruction. Eagan High is one of the partner schools participating in the grant program.